Foregin Exchange and Doctor on call. The bus stand lies at a stones throw from Hotel Poshwan. The features of the hotel include 43 well furnished rooms and suites all having cable television, telephone facilities and attached baths with 24 hour running hot water. A restaurant, within the hotel, serving Kashmiri, Chinese, Mughlai and Continental plus various European dishes, provides 24 hour room service. Also ample parking space is available with the hotel. Doctor available on call in case of any sickness. Pick and drop facilities also available on extra charges. Exclusive tie-ups with pony walas for a safe and comfortable riding. Excellent heating facilities available during the winters. Romantic picture windows through which the soothing hues of nature stream in. 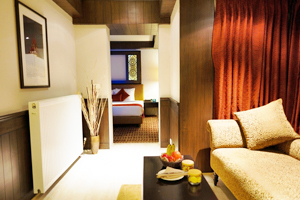 Room facilities include room service, laundry, television with entertainment channels. Telephone with international dialing access and central heating system round the year and much more. 2 Minutes walk to the Highest Natural Golf Course in the World. 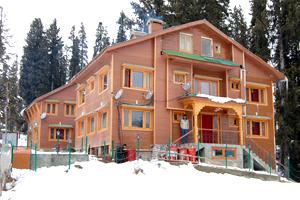 Hotel Royal Park is an ideally located hotel in Gulmarg. Kashmir from where you can enjoy the scenic beauty of rush and green vast lands, meadows of flower and serene view to sooth your eyes and soul. 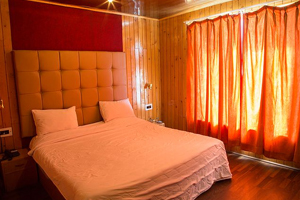 We are in possession of all professional driven roomsâ€™ services, hygienic food besides efficient planning for the successful execution of your trip at Gulmarg. Exclusively furnished rooms with wood floors. Attached Bathrooms with running hot and cold water. Telephone with EPABX facility in Rooms. CCTV in Rooms with individual TATA SKY Satellite Channel System. 24 hour uninterrupted power system with backup of hotel's own Power Generators. Hookah / Sheesha Bar/Cards Room / Bar. Multi-cuisine RestaurantRound-the-clock room service and laundry service. The hotel is equipped with hospitable staff that takes Care Of You every possible need. 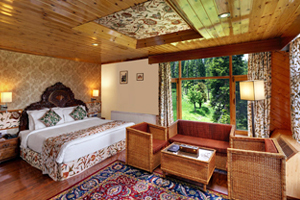 Located 52 km from Srinagar city, Hotel Pine Spring is one of the popular hotels in Gulmarg. The hotel offers a panoramic view of mountains and rivers. The rooms at Hotel Pine Spring has all the modern amenities like telephone with voicemail messaging and international call facility, television with satellite channels and room service (6.00 am to 12.00 am). Rooms have a private bathroom with natural bath amenities. Guest can also avail iron and ironing board as per the need. 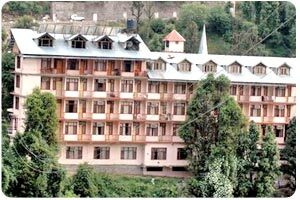 This hotel in Srinagar is Wi-Fi enabled. 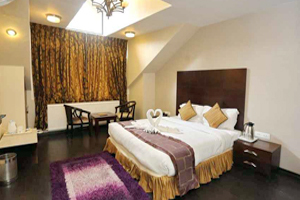 This hotel has abusiness centre and meeting room ideal for corporate travelers. It also has anin-house restaurant that serves multi cuisine delicacies. There is adiscotheque, coffee shop, pool table, table tennis and many more. The hotel has a fitness centre. Popular tourist attractions areDal Lake at 18.2 km, Royal Spring Golf Course at 15.4 km and Shalimar Bagh at25.6 km. 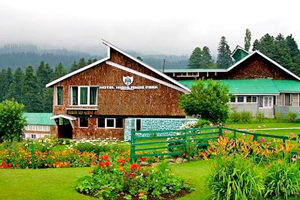 Ensconced in the serenely beautiful Meadow of Flowers that is otherwise known as Gulmarg, Heevan Retreat is your destination of choice in this cup shaped valley that is overflowing with beauty. It is an unmatched beauty that you have to see to believe. Imagine snow all around you on the tree tops, the Affarvat Mountains, the gardens and the hotel roofs in the winters. Also, imagine lush foliage and flowers of every color spreading a heady fragrance in the summers with the best views of Gulmarg right from your hotel room. A mere five minutes from where the Gondola rides begin. Heevan Retreat can offer you all this and more. Go skiing on novice or pro level ski slopes, amble along nature trails to hitherto unexplored vistas, or enjoy a round of golf or you can stay inside with a good book, a roaring fire and a cup of warm Kehwa to keep you company. 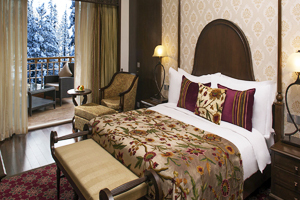 Your room at The Vintage Gulmarg is a place of calm and rest. A feeling of air and light coupled with comfortable living ..
Luxurious spaces with floor to ceiling windows that offer panoramic vistas of snow capped mountains, beautifully landscaped gardens and forests covered with pine trees. State-of-the-art climate control makes you feel comfortable even on the coldest winter night. Built in walnut timber and decorated in traditional Kashmiri silk & wool carpet and hand-made furniture, the rooms exude luxury. All rooms have a walk in closet, electronic safe, LED television, wireless internet access and tea/coffee maker. Bathrooms have a bath tub and shower, bathrobe, slippers and luxury toiletries.